A cool movie about some cool toys with some cool songs. 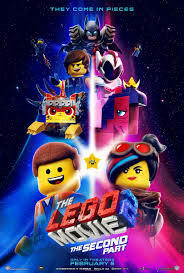 A great follow up to the original LEGO Movie and I’m so loving all these LEGO movies (My favorite being a LEGO Batman movie, which I totally hoped gets a sequel too). I have to admit, cause I can’t shake the fact that, I really enjoyed the frist one much better, but still overall this is a great movie.